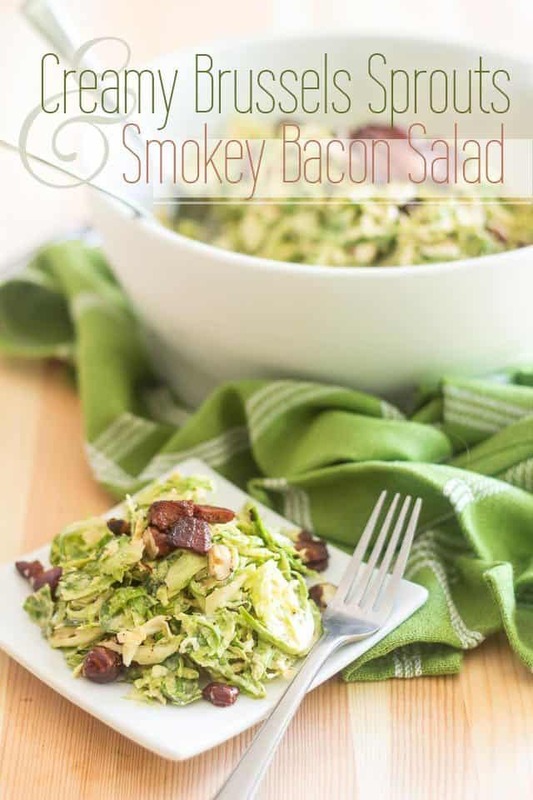 I got the inspiration for this Creamy Brussels Sprouts and Smokey Bacon Salad while standing in line at the grocery store. You know how they always have stands with millions of magazines in them, some keeping you up to date on the latest star gossips and trendiest miracle diets, others providing ideas for your next arts and crafts project, and of course, a whole bunch of them offering a helping hand with your every day cooking! Guess which ones I always end up looking at? 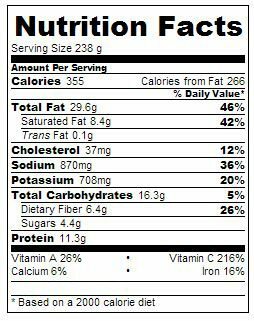 What really struck me about this particular recipe is the fact that they’d actually dumped the warm fat along with the bacon in the salad. For realz! They dared do that, despite the fact that they’d also already added mayo, too! Didn’t they get concerned that 2 gazillion angry people may eventually write in, complaining about how unhealthy that was and how unethical of them to suggest that their readers should actually eat that? I mean, how could they? Not only did they add bacon to their dish, but they also used the fat AND added mayo on top of that? Had they never heard of the dangers of fat and how its being related to heart strokes, high cholesterol and blocked arteries? Were they trying to kill their readers? I mentally applauded, told my brain to remember that I wanted to make a similar salad sometime soon and put the magazine back: it was now time to pay for my items. Honestly though, I can’t even begin to understand how come I didn’t buy the magazine. It was worth holding on to, if only for that recipe. Now I can’t even remember which magazine the recipe was published in, or what actually went into the salad. All I know for sure is that it had shaved Brussels sprouts, mayo, crispy bacon AND WARM BACON FAT! I think the addition of warm bacon fat is absolutely genius. 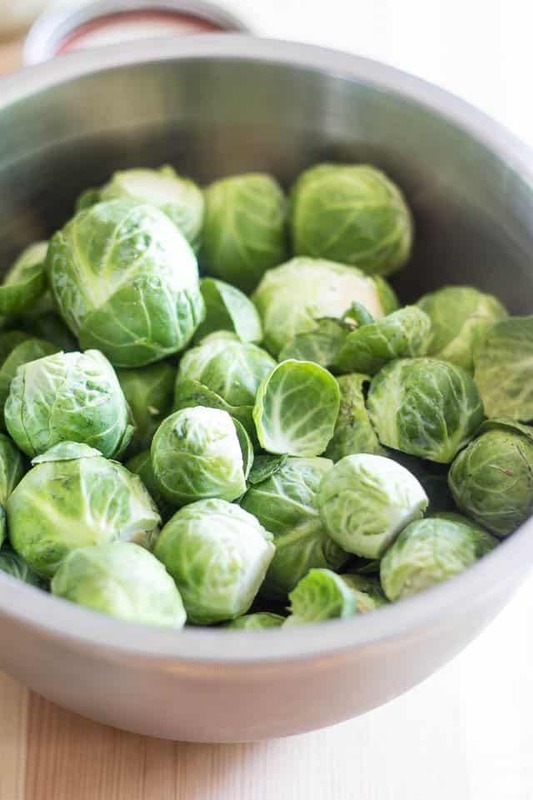 Not only does it confer the most delicious flavor to the dish, it also helps in softening up the Brussels sprouts, which sometimes tend to be a little bit on the tough side when they’re raw. Massaging them really helps with that, too… but we’ll get to that later. Fisrt, we need to shave those sprouts! Let’s get busy doing just that! 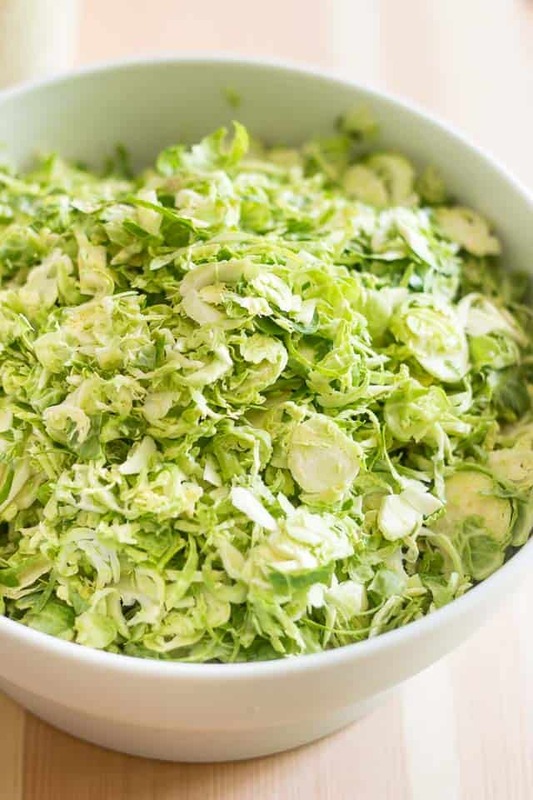 When it comes to shaving Brussels sprouts, I find the most efficient way to get the job done is by using the slicing disk of your food processor. That’ll go through pounds of them in mere seconds! Of course, you could also grate them using a box grater or even slice them thinly with a knife, if you needed to have your patience tested! Honestly though, the food processor is the better option, trust me on that one. Also too, whenever I shave Brussels sprouts, I like to make some extra and keep them in the fridge in an airtight container. 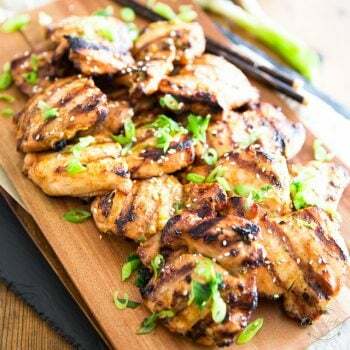 They then cook so rapidly, you can whip up a delicious side in just a couple of seconds: simply throw a handful in a hot skillet with a little bit of ghee or coconut oil. This is so good, it’ll no doubt become part of your regular rotation. 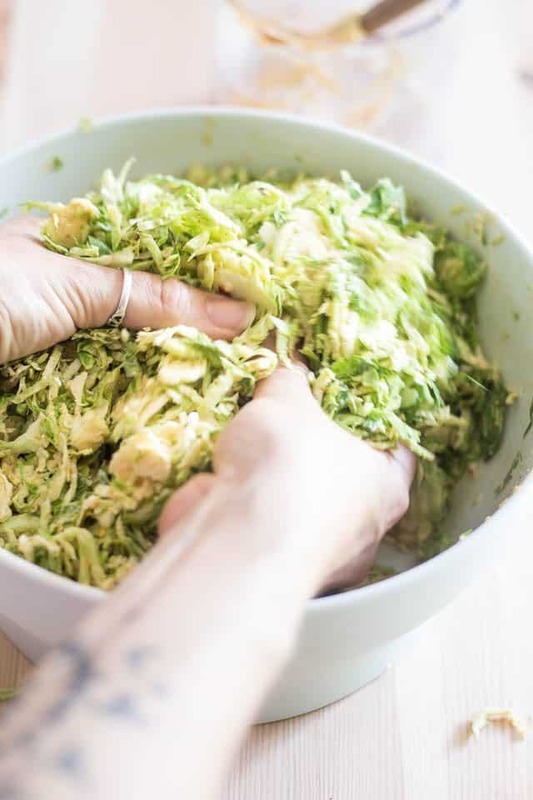 Alright, so now that you’ve shaven those Brussels sprouts, throw about 2 pounds of ’em into a large mixing bowl. Really. Make that a LARGE mixing bowl. Unless you don’t mind throwing bits and pieces of food all over the place like I did. 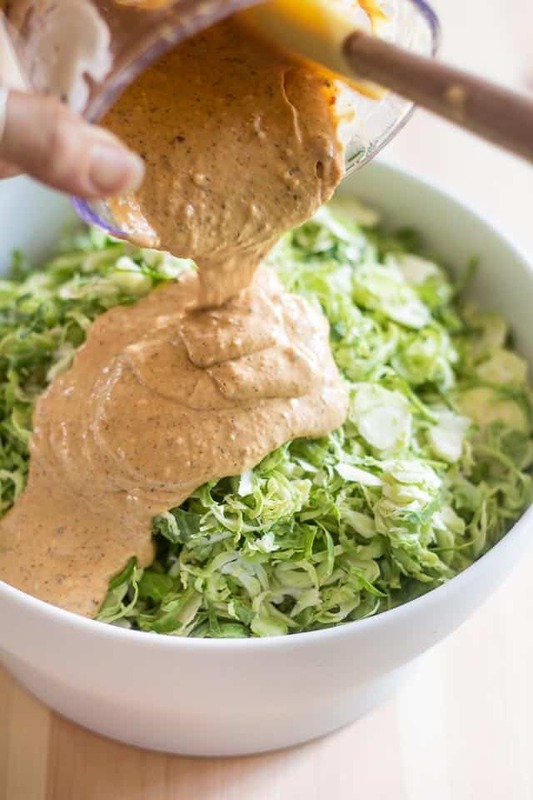 Make the dressing by adding mayo, Dijon mustard, garlic, chipotle powder, vinegar, salt, pepper, onion powder and chili pepper flakes to a small food processor and process until smooth and creamy. Pour this dressing over the shaved Brussels sprouts. Now you want to mix this really well, preferably with your hands. The idea is to massage and bruise your sprouts in an effort to get them to soften up a little and release some of their water. So really, go at it with all your heart and then set this aside. We have some BACON to cook! 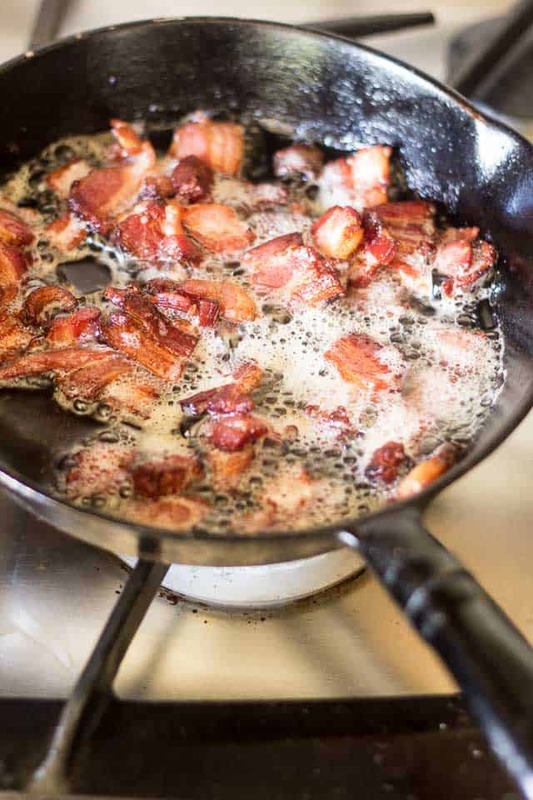 Set a skillet over medium heat and cook the bacon until it gets nice and crispy. And uhm… try not to eat it all! 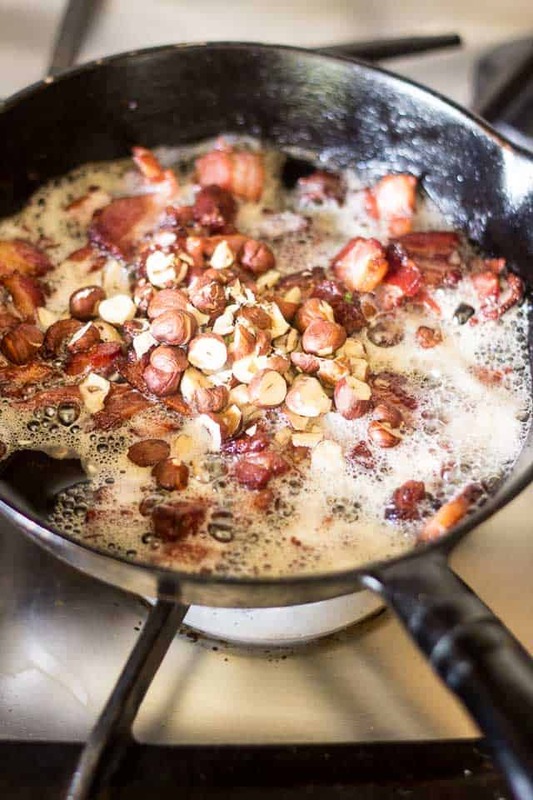 When the bacon is done to your liking, throw in the hazelnuts and cook them for about 30 seconds, just to heat them up a bit and get them to become a tad more fragrant as they brown and get infused with that tasty bacon fat. Pour all of that right over your reserved salad, INCLUDING the hot bacon fat. 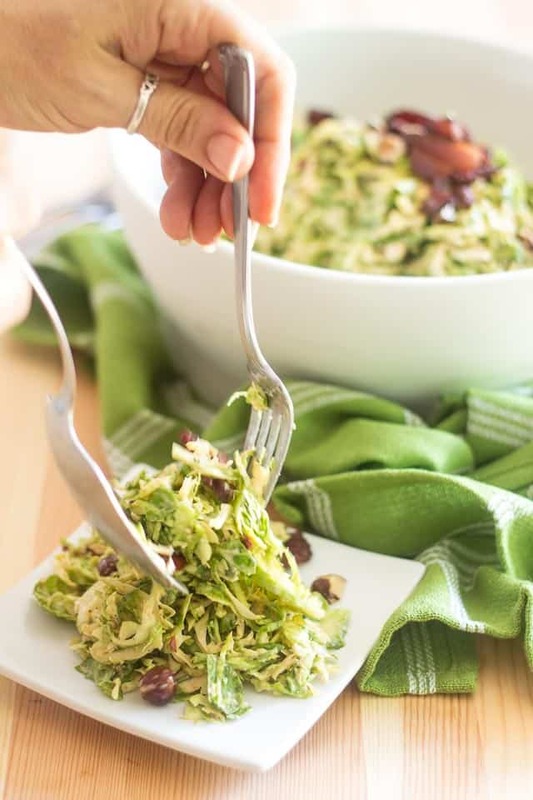 This will not only impart tons of flavor to your salad, but the heat of the fat will also contribute in making the Brussels sprouts a tad more supple. Now all that’s left to do is give everything a good toss. 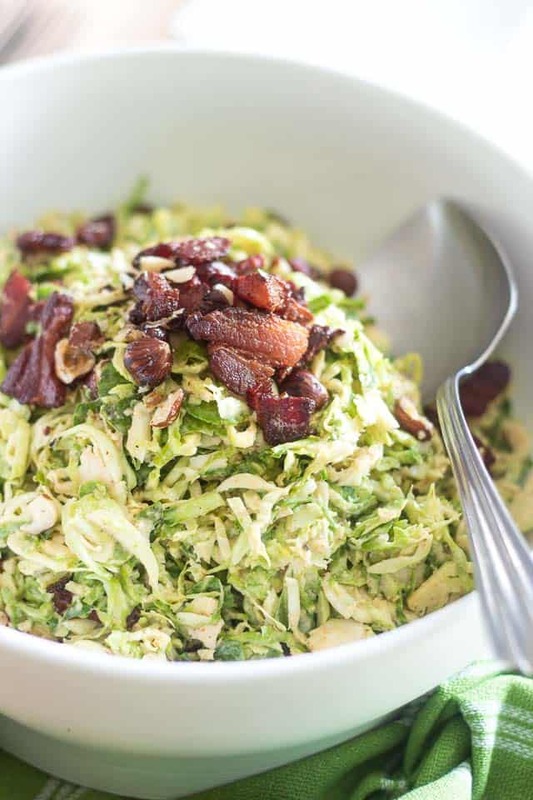 Of course, if you want to get fancy and garnish your salad to make it pretty, save a few pieces of bacon and chopped hazelnuts to throw on top once it’s all good and mixed. Only one thing left to do now: serve and enjoy! I don’t think I need to tell you that this has instantly become a favorite of mine, and I believe it will have the same effect on you. This salad packs an awful lot of flavors and textures, yet it goes good with just about everything. Not only that, it seems like it keeps forever and will look and taste just as fresh after it’s spent 5 days in the fridge as it did after you just made it. Oh, and yeah… it’s equally good served warm or cold. I never could decide which version I liked best. All I know, is I liked it more every time I got to eat some. First off, you will need to shave the Brussels sprouts. 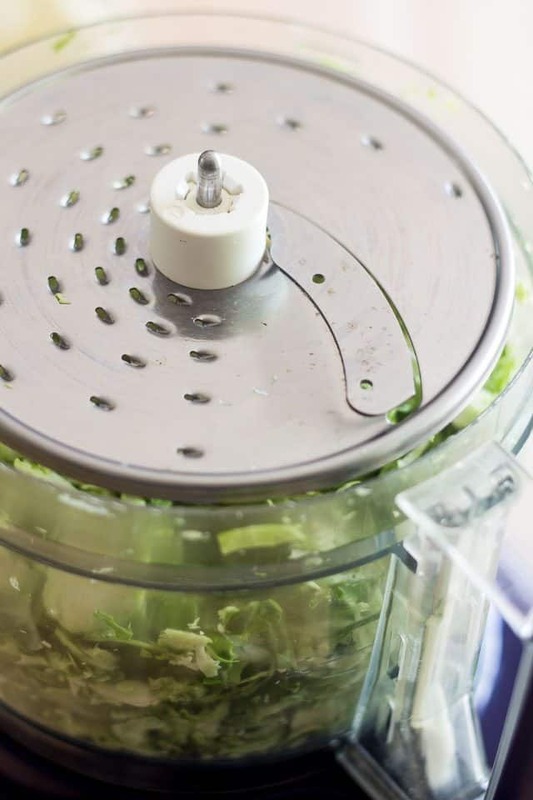 The most efficient way to get this done is by using the slicing disk of your food processor, but alternatively, you could grate them with a box grater or slice them thinly with a knife. Then add the mayo, mustard, garlic, chipotle powder, vinegar, salt, pepper, onion powder and chili flakes to a small food processor and process until smooth and creamy. 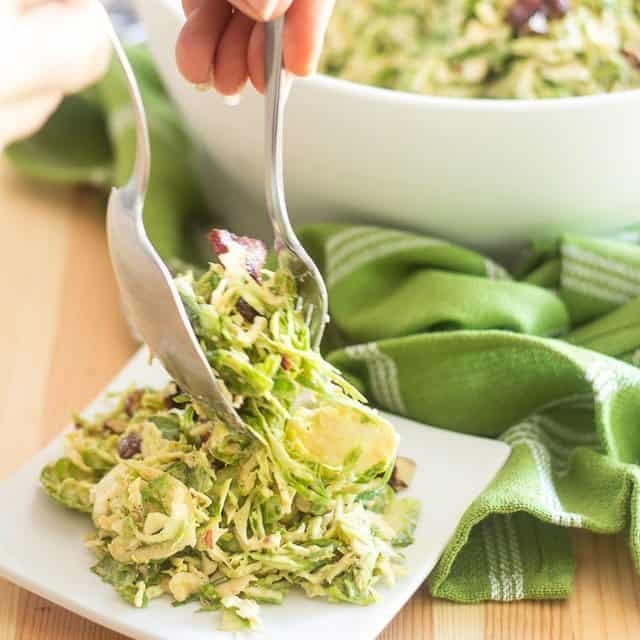 Pour this dressing over the shaved Brussels sprouts and mix really well, ideally with your hands, massaging and bruising the sprouts a little bit to get them to soften up and release some of their water. Set aside. In a skillet set over medium heat, cook the bacon until nice and crispy, then throw the hazelnuts right in. Continue cooking for about 30 seconds, then immediately pour all of this, including the bacon fat, right into the reserved salad. Toss real well and serve immediately. Looks amazing. My mom actually used to make a similar recipe, but it was a broccoli and bacon dish with carrots, celery, dried cranberries, and all sorts of other yummy stuff in there. 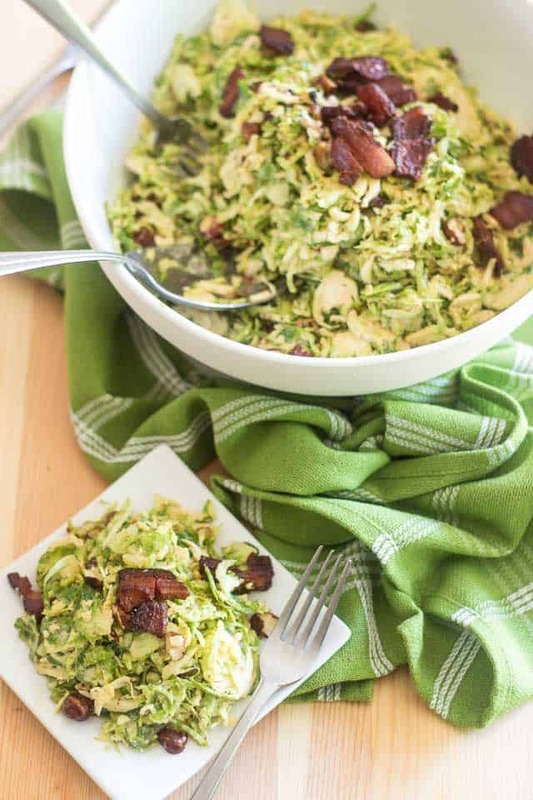 I’m a huge brussel sprout fan though, and I’m always looking for new recipes! MmmM! Oh my yum! That salad sounds soooo good. I think I need to make it! Like NOW! 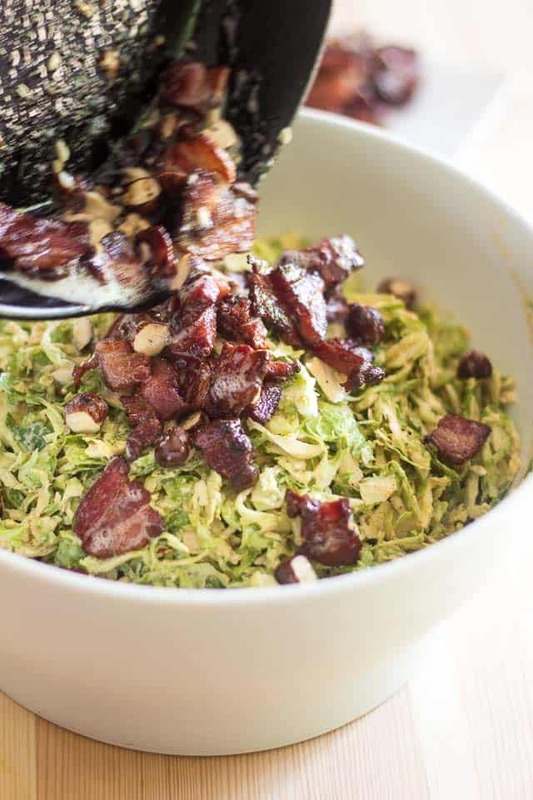 I love to cook brussel sprouts in bacon fat but somehow I’ve never thought to shred the sprouts up like this! Love how it looks and could totally see myself serving this up as a side at Thanksgiving. So true! That would make for a perfect Thanksgiving dish. I hadn’t even thought of that! OMG this sounds amazing! Can’t wait to try it. Pinned!!! I used to despise Brussels sprouts! I absolutely adore them now, especially in slaws & salads! This will for sure be making rounds at the dinner table soon. Wow Sonia, so literally my mouth is watering right now. 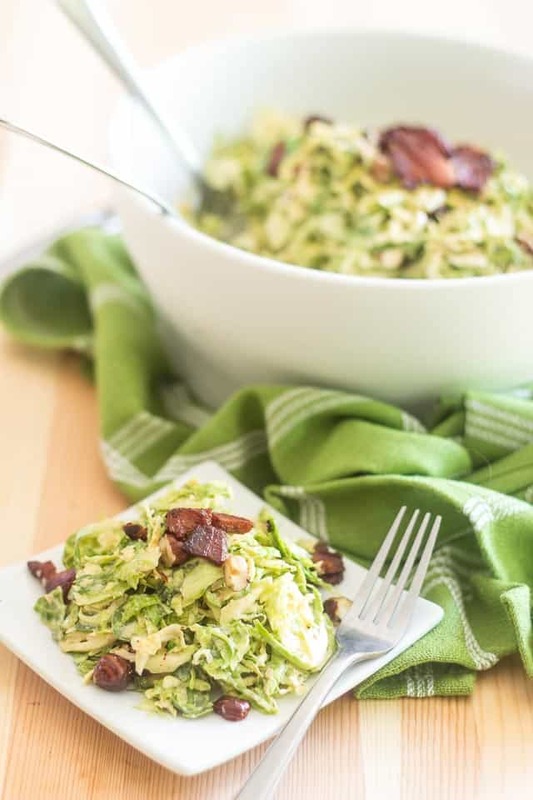 I love brussels sprouts, add in the bacon and yummy dressing and call it a night. I think I could just sit and it this by itself! Love it! HAHA! True! 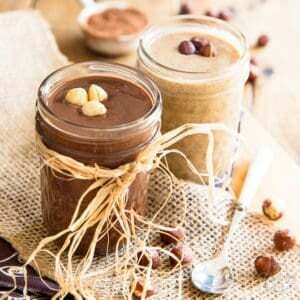 Hmmmm… I bet almond butter would be amazing in this. I think I need to try it! Oh my gosh! This looks so amazing. Pretty easy, too! Definitely making this. 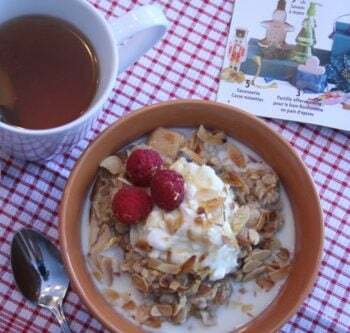 Thank you so much for looking at that magazine and remembering to recreate the recipe!!! Our farmers’ markets are overrun by brussels sprouts right now. I still don’t like them cooked, but this recipe gives me hope about adding a grown up food to my veggie rotation. 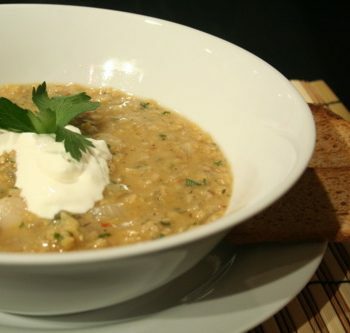 This was a fantastic recipe. We made it this weekend and my husband is already begging for it several more times before the end of the week! I did make a couple of modifications I think worked well though….first, after shaving the brussels, I tossed them with a tsp or so of melted bacon fat and roasted in a 425 oven for 7-8 minutes just to soften them a bit before tossing in the dressing, I also roughly smashed up the hazelnuts before adding to the bacon so we had more little crunchy bits to go around. And I didn’t need to add ALL the bacon grease from the pan to the salad….I probably added about half and there was more than enough deliciousness in there. The whole thing would have been a bit too greasy for hubby (not for me! I’m from Texas, I can mainline bacon grease). But TOTALLY a make again deal, thank you for the ingenuity! Thanks a bunch taking the time to leave such great feedback, Ali, I always appreciate that SO very much! 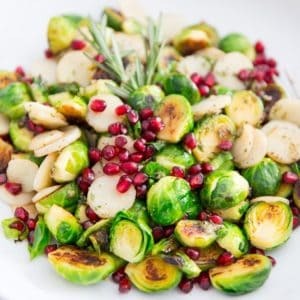 I love the little tweaks that you made, too, especially your roasting the Brussels sprouts. I might very well have to try that for myself. Tell me, did you eat the dish while it was still hot or did you let it cool before serving it? Any ideas on a sub for the hazelnuts? 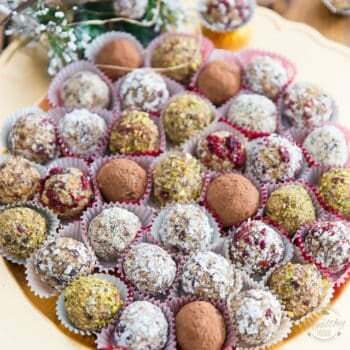 I want to serve this at a dinner this weekend but one of our guests is allergic to them (but not all tree nuts). What do you think would be the best nut to sub? I would definitely go with toasted almonds, or maybe even smoked almonds. Oh yeah. Those would be grand! WOW! Thanks so much Ali! I am deeply touched that you would remember that… I hardly even remembered myself. Me again (yes, I am obsessed with this recipe). I must make this for Thanksgiving dinner but I have a problem. One of our guests is pregnant, and I know she avoids mayonnaise because of the raw egg….. thoughts or solutions on what I could do? I totally understand that, Ali, my daughter is the exact same. She can’t have my mayo, makes her puke every single time, without fail! Why HIMALAYAN salt? Can i just use kosher salt? THanks. I use Himalayan salt because I find it to be the best option available, but kosher is also a great choice. Wow, this is so good. I made only enough for two servings because I didn’t even have 200 grams Brussels Sprouts but I could have eaten the whole lot of it. I did throw the Brussels Sprouts in with the bacon for a few minutes because raw didn’t appeal to me. This is being added to my menu!